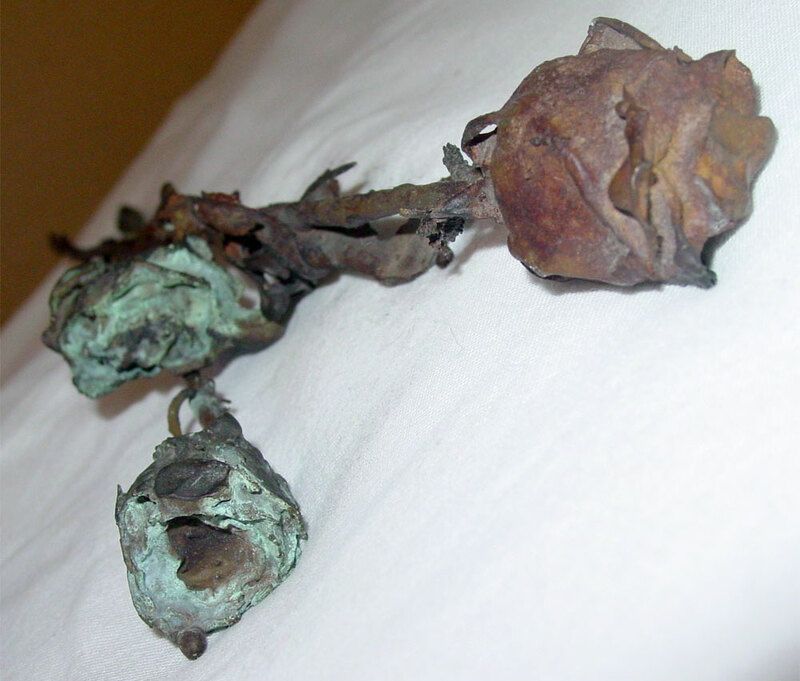 I made these roses using the lost wax casting method; each one started life as a dried long-stemmed rose, which I dipped in wax and made ready for casting. The process only worked about 25% of the time, because of the long thin stem the metal had to travel to get to the solid flower, and the leaves almost never cast. I left the bits of flash and other imperfections on them as part of their character, the human element intervening in nature long enough to create these haunting pieces. The element of randomness is one I enjoy exploring in my art, and you can really see how it gave these roses a new life. They get their color from a chemical patina, another process involving water and fire that has slowly evolved over time thanks to exposure to the air and handling. I’ve sold all of the half dozen or so that I originally made, but maybe someday I’ll be in a position to create more. I seriously love these. They’re gorgeous!